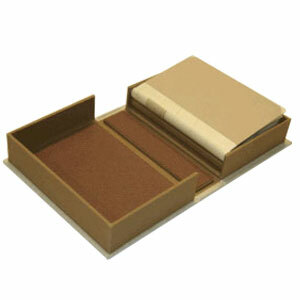 The deluxe clamshell is a strong and durable double-tray clamshell crafted from high-density binder’s board. 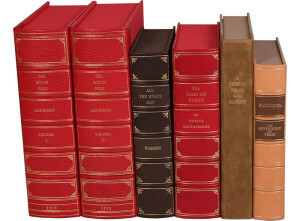 The standard deluxe clamshell is covered in premium imported bookcloth, available in a variety of colors. Titling is foil stamped directly onto the cloth. Minimum thickness for a deluxe clamshell is 1/2″. Every deluxe clamshell is handmade to fit each individual item perfectly. Email us the measurements using our convenient order spreadsheet. Worried about measuring your items correctly? View our Tips on Measuring, or contact us to arrange shipment of your items to our facility so we can do the measuring for you! 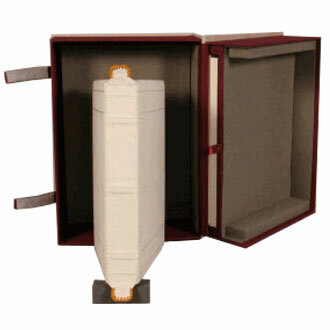 What separates our “Deluxe Clamshell Boxes” from all others is the unique design of the spine section which provides a virtually air tight seal eliminating air infiltration from the environment. We use high-density, acid free binder’s board to construct our enclosures. Our PVA adhesive meets library binding standards for long term stability. The trays are lined with paper that has a 3% alkaline reserve. The use of MicroChamber© papers containing zeolites for contaminant absorption or Silversafe© papers for photographic materials are optional. Our deluxe clamshells incorporate the highest quality acid-free and lignin-free binder's board for both the cover and tray structures. The cover material is a premium imported book cloth such as Brillianta from the Netherlands or Canapetta from Italy. A variety of colors are available depending on your design requirements. The case cloth and cloth for the trays can be of different colors for a very distinguished look, and we offer a wide variety of imitation leathers and genuine leathers as well. View our selection. Still don't see what you want? Contact us to make a special request. Standard foil stamping is available in black, white or gold. Additional colors and fonts are available via our special print upgrade. We also offer foil stamped, laser printed and genuine leather labels. We offer additional options to provide full protection for your valuable items. The interior trays can be modified to support items that are too thin or are uniquely shaped. Velcro strap fasteners or Japanese bone clasps to lock the trays may be incorporated into the enclosure as an option. Clamshell box fasteners are highly recommended for vellum bindings.